With the flights booked, the next task was to sort out accommodation. The main criteria being a central location and not too expensive. After the usual research involving Google, Trip Advisor and Trivago, we settled on Hotel Preciados. 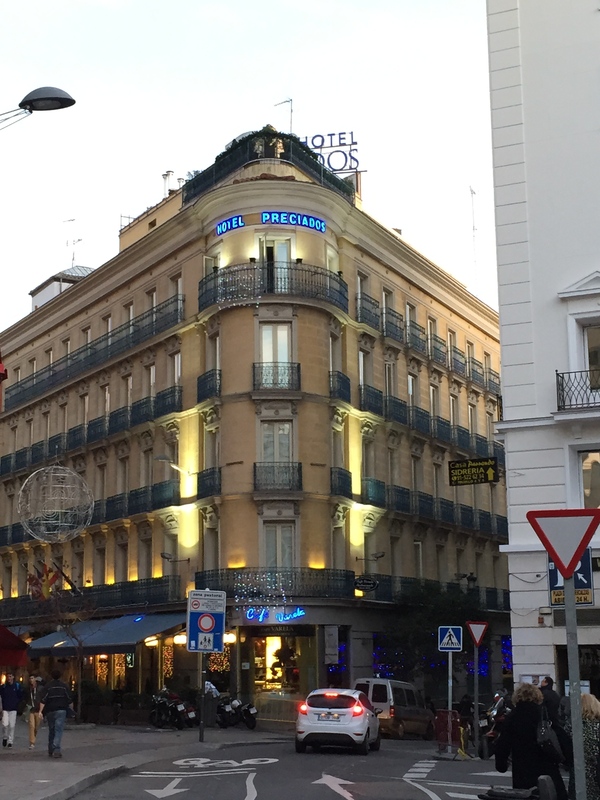 http://us.preciadoshotel.com/ The hotel is rated 4 stars and is located close to the Plaza Mayor and within easy walking distance of many of the main sights including the Royal Palace. Its closest Metro station is Santo Domingo (Red Line) and the Metro system is very convenient and easy to use (and astonishingly clean!). We arrived in the Airport and discovered there is a set taxi fare of €30 in to the centre of Madrid. This makes it very simple for tourists as there is then no worry about whether or not you are being taken the most direct route etc. We were dropped outside our hotel whereby the Taxi Driver requested an additional €5. He didn’t speak English but rather than hand over the additional €5, we repeatedly asked him why the set fare wasn’t being adhered to. He eventually accepted the set fare and left. Although, tipping is not practiced widely in Madrid, he may have gotten a tip from us if he had not tried his little scam. If this happens to you, an easy way out of it is to ask for an official receipt. The taxi driver will not be able to provide this without incriminating himself for not adhering to the set fare and will most certainly immediately accept the €30. We were very satisfied with our hotel. The rooms were big, the beds comfortable and very clean. Wifi was free and the service was good. Our rate did not include breakfast, but this proved to be a good thing. There are plenty of lovely cafés and bakeries in Madrid and prices are really inexpensive. We managed to get change out of €5 for two coffees and two pastries most mornings! And there is no shame in having Churros and chocolate for breakfast either! We really enjoyed our days in Madrid and saw most of the sights. We visited the Prado Museum (Museo Nacional del Prado) and the Almudena Cathedral. 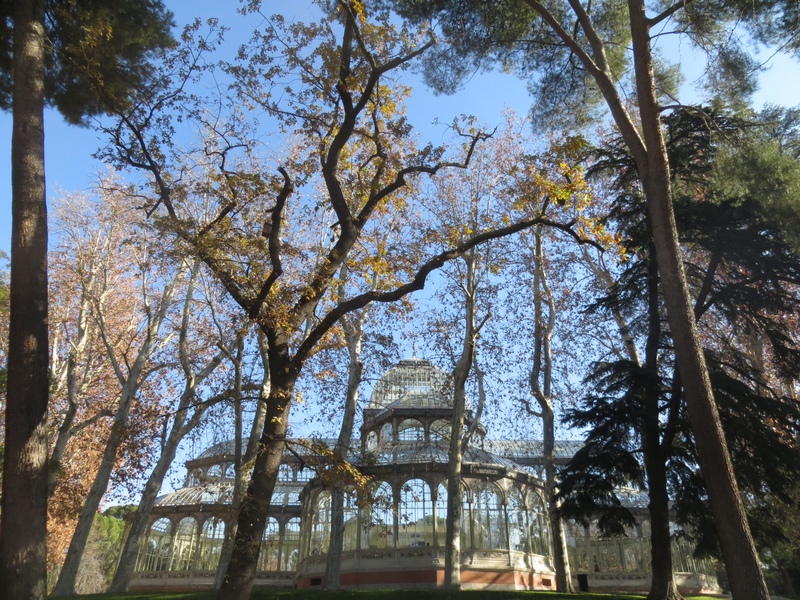 We walked through the Parque del Retiro, which really is Madrid’s equivalent to New York’s Central Park – complete with boating lake, and visited the Palacio de Cristal within the park. This was one of the highlights of the trip. The Palacio de Cristal (Crystal Palace) is a stunningly beautiful building. It often holds exhibitions and there was one on whilst we were there entitled “The Puppet Maker”. This exhibition will remain there until March 16th 2015 and is well worth a visit. 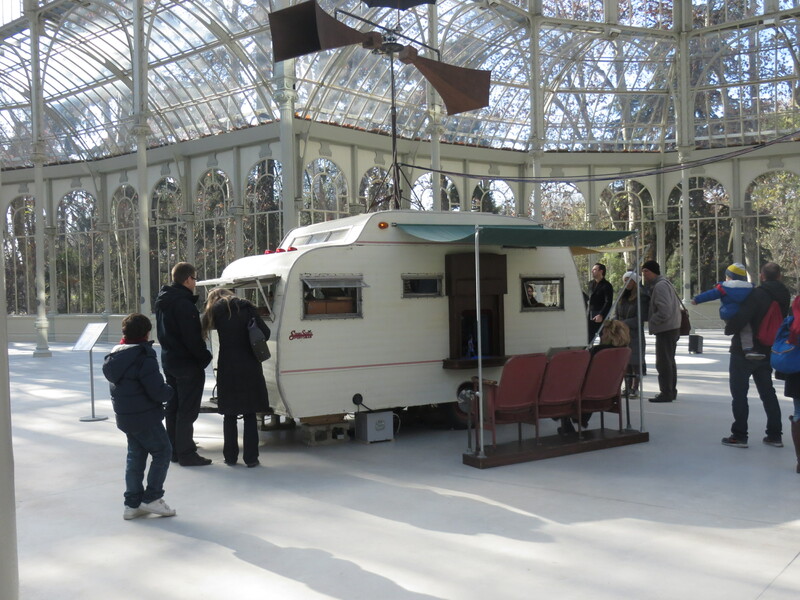 Unusually, the exhibition is contained in and around a small caravan parked within the Palace. The public could not enter the caravan but could view through open windows. It was very unusual and thought provoking. Here are a couple of little clips of what was happening inside the caravan! 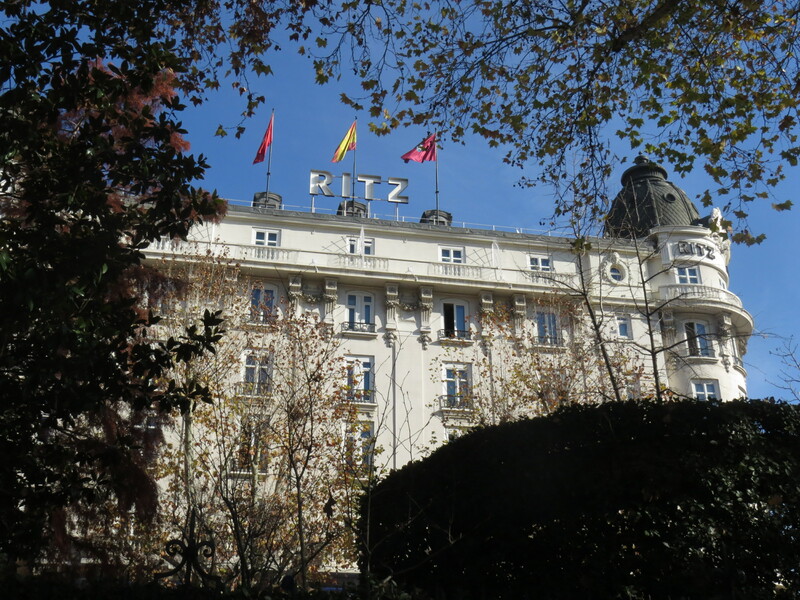 We also visited the Ritz Hotel during the afternoon. We did not have the traditional Afternoon Tea there but gather it is quite the thing to do in Madrid. In contrast to the prices we paid in pubs and restaurants around the city, the Ritz is very expensive. €8 for a (small) coffee and c. €10 for a glass of wine. The wine is clearly better value for money there!. We did not manage to visit the Santiago Bernabéu Stadium, the home of Real Madrid, on this occasion which was a disappointment and I am definitely going to return to Madrid to visit both that and also the Palace (Palacio Real de Madrid). One of the most fun parts of visiting Madrid is deciding where to eat and drink. We were very pleasantly surprised at the price of food and wine in Madrid and quite often spent as low as €1.60 on a glass of wine. We quickly came to realise (largely influenced by the language barrier) that if we wanted a glass of white wine, rather than try and order a specific type, to just accept whatever Vino Blanco was on offer. This made things much easier and we never got a bad wine! We had read in advance that the Madrilenos like to eat late. Whilst this is true, we discovered that certainly during the week, restaurants/tapas bars do not open as late as you might think. We enjoyed trying the tapas bars along the Cava Baja. Some were better than others, but our favourite for a glass of wine and some nibbles was La Taberna de Goyo. We really enjoyed the Jamon Iberico there (below). As mentioned earlier, there is no real culture of tipping in Madrid, but if you do tip, even moderately, you will be looked after with lots of bites to taste. We really enjoyed La Taberna de Goyo and the staff really looked after us. 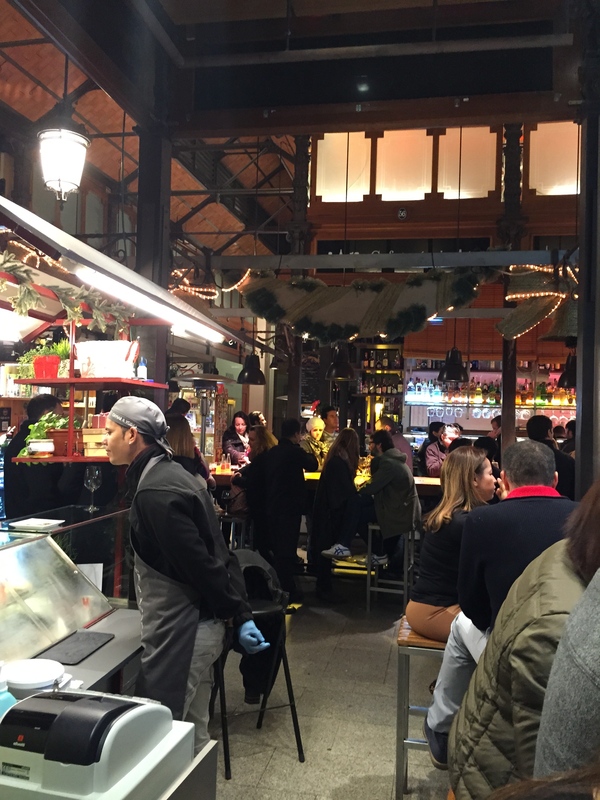 A must visit in Madrid is the Mercado San Miguel. This is a real culinary hot spot in the centre of the city where you can purchase food and drink to eat there or take away. The quality of all the produce is superb. We ate lunch there on one day and really enjoyed it. There was no way we felt guilty about having a glass of wine early in the day as everyone seemed to be drinking. We went back one evening and it was not nearly as much fun as it was so busy. Getting a seat was the preoccupation of the whole evening and of everyone that was there. It was indeed a sport in itself! 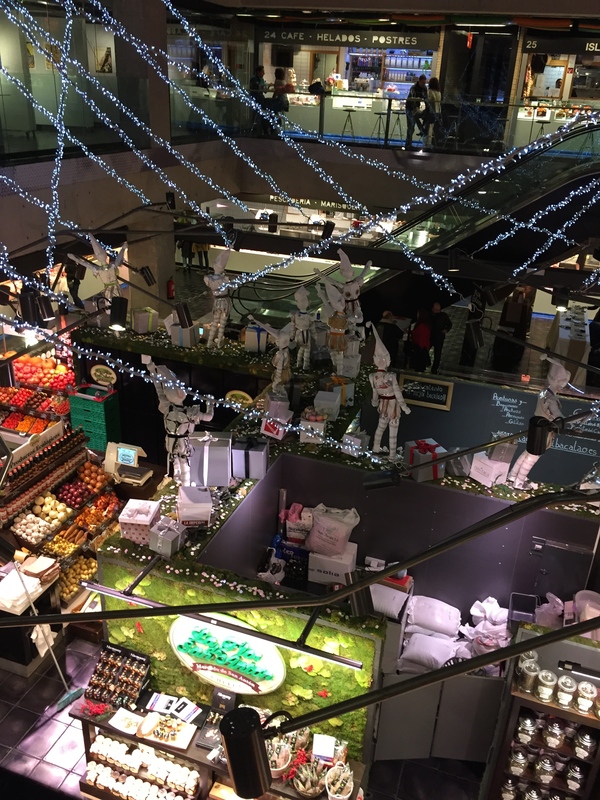 There is also a second food market worth checking out called Mercado San Anton. http://www.mercadosananton.com/ This is a smaller market than San Miguel. It has some lovely food stalls at ground level, on the first floor you can order at the many food and drink stalls and eat at communal seating and there is a restaurant on the second floor. If you go early you will easily grab a high stool on the first floor and eat overlooking the food market below. The food is very good here and it is less frantic than San Miguel. 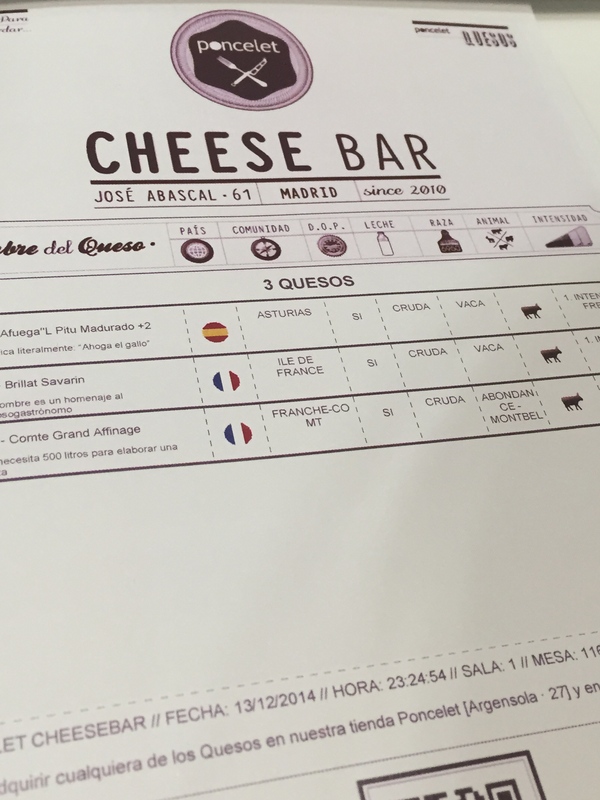 We also paid a visit to the Cheese Bar in Madrid. This is a very impressive place with a very extensive cheese menu. It is not cheap but the quality is superb and the staff are very knowledgeable. 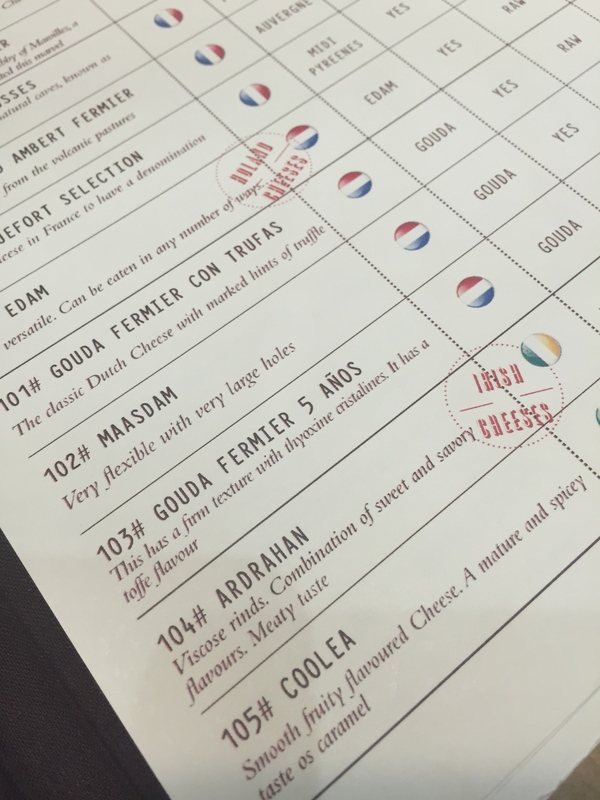 I was very pleased to see a number of quality Irish cheeses on the menu. 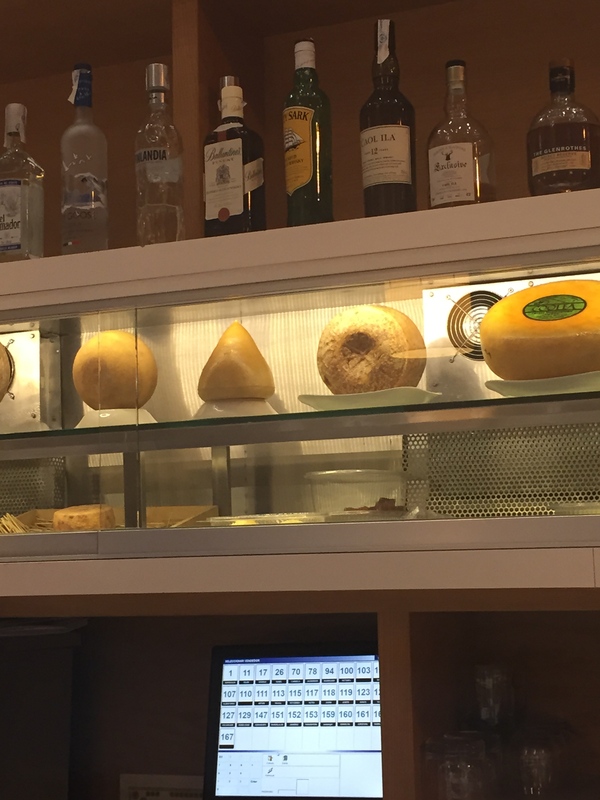 We chose to sample three cheeses (€15) and really enjoyed them. 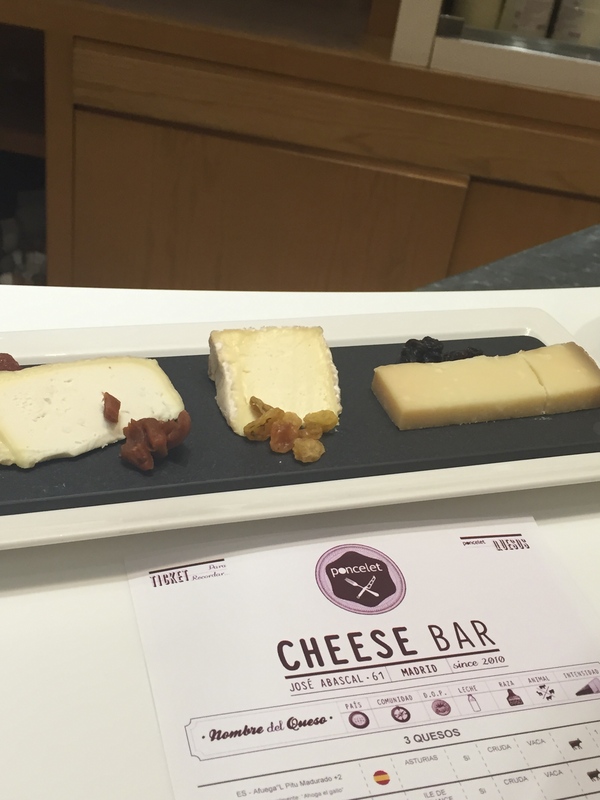 Well worth a visit for cheese lovers. By far my favourite food experience in Madrid was StreetXo. 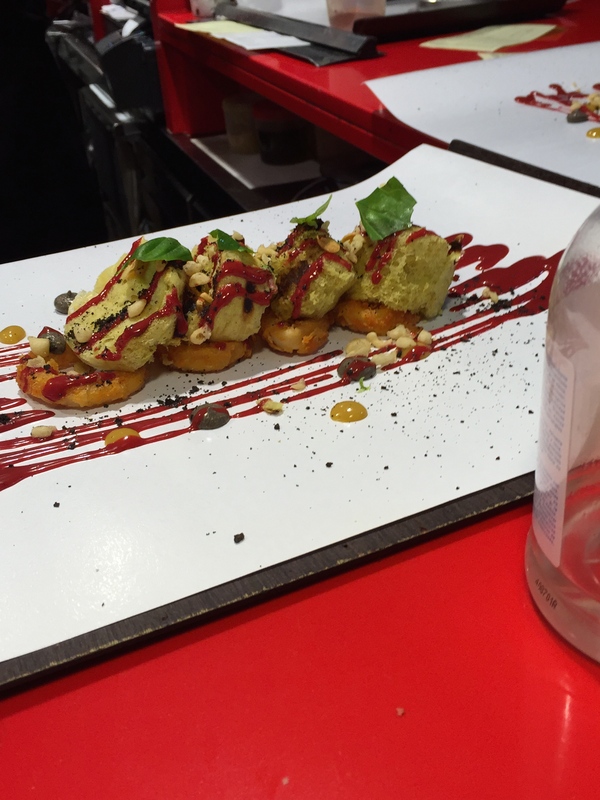 At the time we were there, StreetXo was part of the Gourmet Experience on the 9th floor of Department Store El Corte Inglés at Callao – an upmarket food court. Each eatery has about 10 dedicated high stools or otherwise you can avail of the communal seating away from the action. Michelin starred chef David Munoz is behind StreetXo – bringing michelin starred food within the reach of everyone. The demand for the seats surrounding this tiny “kitchen” is huge. We were lucky to grab standing room at the bar and watch the delightful dishes being produced. The quality is superb and the dishes are priced c. €14 each. Since we were there, I understand StreetXo has moved to a different El Corte Inglés branch at Serrano. This is a must visit when in Madrid. Get there early or be prepared to engage in the (by now familiar) sport of trying to catch a seat when someone leaves. You won’t be alone though, there are likely to be many people eyeing that same seat!. 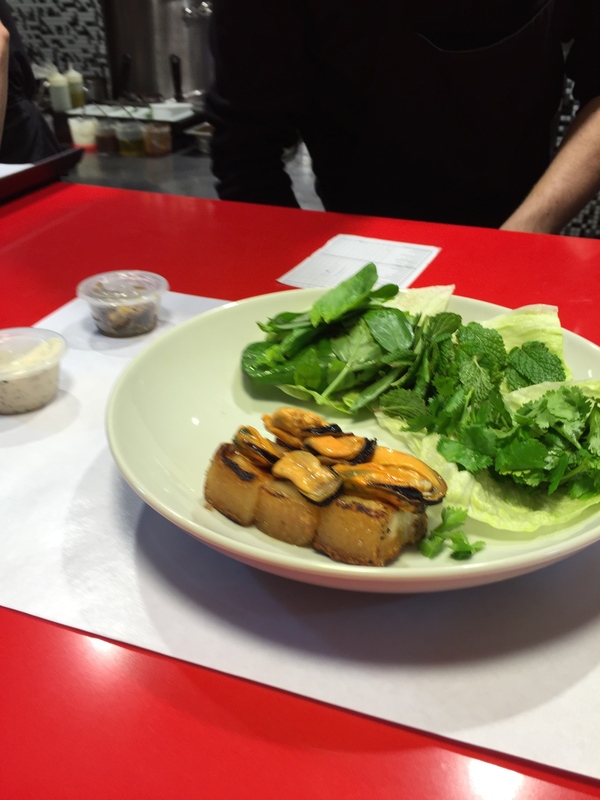 Dishes include Butterfish, Pork Belly with Mussels, Black Pig Ramen, and Calamari. Art on a plate – or not perhaps – if you eat at the counter some of the dishes are served on a sheet of paper! Above: Calamari with sponge bread. Below: Pork Belly with Mussels, Herbs, Tartar Sauce & Pickled Shitake mushrooms. We had many great food experiences in Madrid but also some mediocre ones. 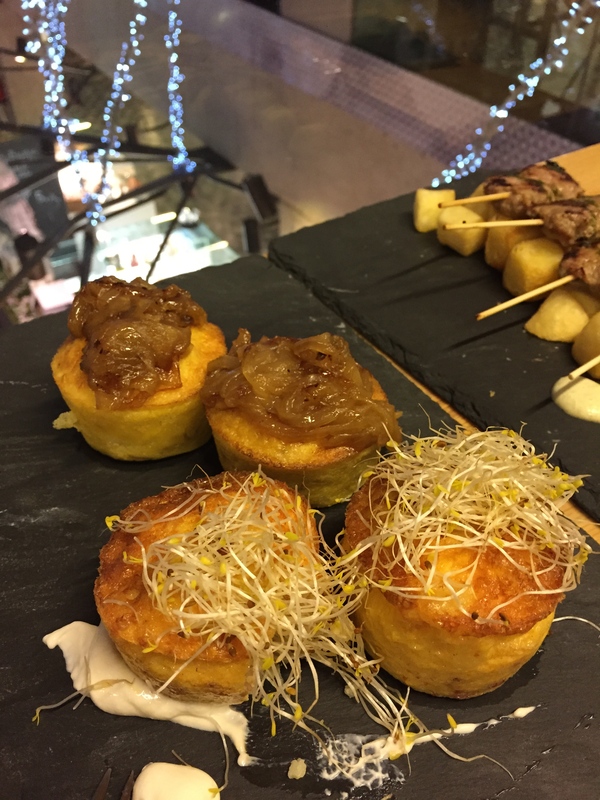 If you are not enjoying the traditional Tapas scene and would prefer to eat their cuisine in a more modern setting then try Tapa Tapa on Gran Via. 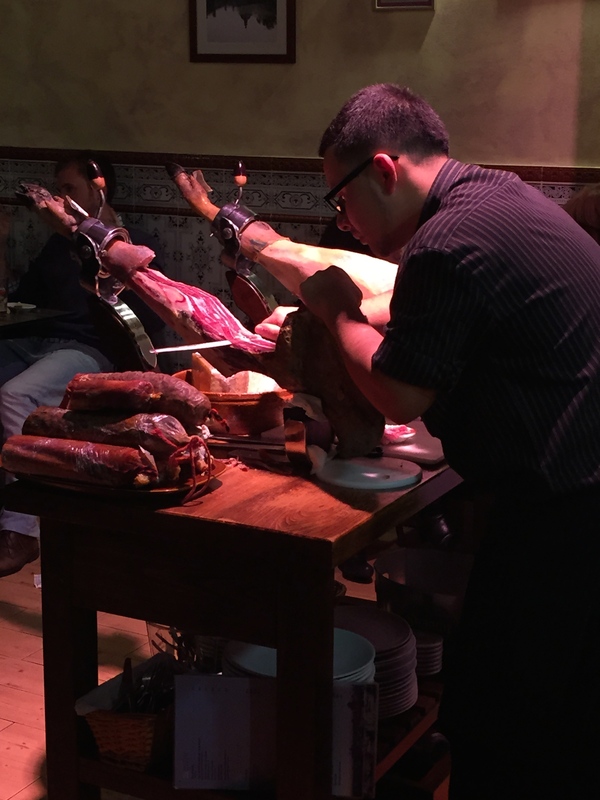 It would definitely not be one for the traditionalists but it is bright and modern, has a great atmosphere and the Tapas are very good and you can get all the dishes you would expect to be available. It is part of a chain but the quality is high – I compare it to Zaragoza in Dublin for those reading this from Ireland. We really loved Madrid and were sorry to leave. There are definitely reasons to return and I look forward to doing so. We made great use of the Metro during our stay. It is a great service, very inexpensive and it also goes to the Airport. We used it on our return journey. The only drawback is that the Airport train does not go from the City Centre so you have to change at least once depending on where your hotel is. Whilst you are there, it would be worth buying a ten journey ticket but be aware you will still have to pay an Airport supplement even if you have a ticket. Another tip is to make sure you discover which exit you need from your destination station as it can be confusing when you get there! Enjoy Madrid, it’s great fun.